In 1914 New Zealanders rallied to the British Empire’s cause, to defend the ideals of justice and freedom. Soldiers expected to fight in a short European war. Instead they landed at Gallipoli and the Anzac story began. WW100 is interested in corporate partners who share the vision to reach the widest New Zealand audience with New Zealand’s biggest story. In the face of appalling experiences, the First World War brought out qualities of endurance, courage, friendship and commitment to a sense of decency and shared values. At home and in Turkey, France and Belgium, and Sinai / Palestine, many New Zealanders came to see themselves as Kiwis – versatile, practical and highly praised here and abroad for their fighting ability and achievements. A Colmar Brunton national study found 88% of New Zealanders are interested in this history and almost 60% are strongly interested. 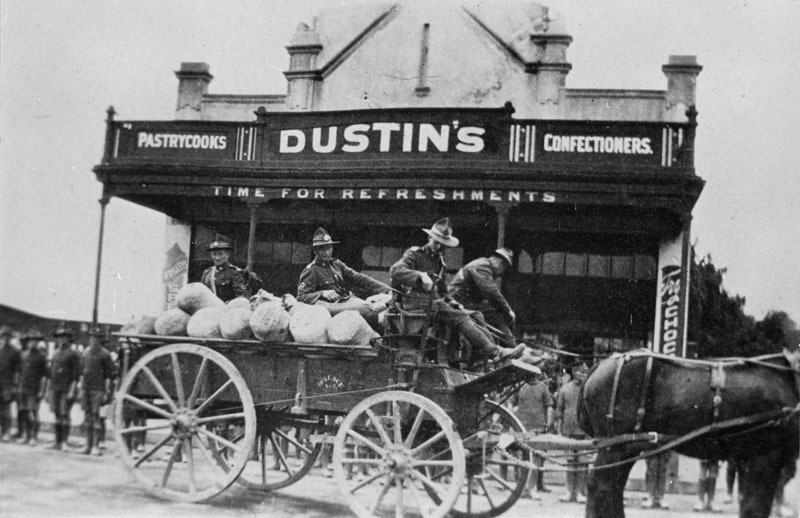 First World War soldiers with a horse and cart, outside Dustin's home cookery shop, Palmerston North. Courtesy of Palmerston North City Library. WW100 is presented in partnership between the Ministry for Culture and Heritage, New Zealand Defence Force, Ministry of Foreign Affairs and Trade and Department of Internal Affairs with the Department of the Prime Minister and Cabinet. This national programme provides ceremonial commemorations for noteworthy historical events from 1914-1919 led by the Prime Minister, Governor General and important New Zealand representatives. It is also a platform for more than 750 activities and events organised by stakeholders around the country, as well as an international diplomacy programme, official publications, legacy projects and education in schools. WW100 is interested in corporate partners who share the vision to reach the widest New Zealand audience with New Zealand’s biggest story. WW100 is telling a fundamental Kiwi story, distinctive New Zealand stories captured as legacies through broad-reaching, national, innovative projects. You may already be working within your local communities, local organisations, or with your staff or the RSA on centenary activities. As the national programme, the WW100 office can support this work. There is a community sponsorship guide. On a national level, partnership possibilities exist with WW100 as a Commemoration Partner or Corporate Sponsor of key projects.